If rich nations think they can escape unscathed from the damaging effects of global warming, it’s time for a re-check. The new report of the United Nation’s Intergovernmental Panel on Climate Change (IPCC) has one again sounded a warning bell about impending disasters, raising it to a whole new level this time. Climate change has already affected agriculture, human health, ecosystems on land and in the oceans, water supplies, and some people’s livelihoods. “The striking feature of observed impacts is that they are occurring from the tropics to the poles, from small islands to large continents, and from the wealthiest countries to the poorest,” says the report released in Yokohama. “Nobody on this planet is going to be untouched by the impacts of climate change,” said Rajendra Pachauri, IPCC chairman and India-based TERI head, at the release of the most comprehensive climate change study. "This particular report has quoted significant risks of death, ill-health, injury in low-lying and coastal areas due to floods and rise in sea levels. Food insecurity, low agricultural yields, biodiversity loss are some of the other major issues. Disasters with extreme weathers and risks with heat waves and high precipitation are other issues. Inertia is required to deal with climate change. We have covered a number of adaptation measures but with high levels of Green House Gases emissions, even adaptation will be a challenge. The message: The world will have to not only adapt but also mitigate the climate change risks, said Pachauri. The report identifies vulnerable people, industries, and ecosystems around the world. “It finds that risk from a changing climate comes from vulnerability (lack of preparedness) and exposure (people or assets in harm’s way) overlapping with hazards (triggering climate events or trends). Each of these three components can be a target for smart actions to decrease risk,” says a statement from the Nobel Peace Prize-winning panel. News for Asia, home to most populous countries including India and China, is not so good. The report predicts Asia will not only have to face more extreme weather events but also a stress on drinking water and foodgrain by the middle of the century. Both India and China may have to see “negative impacts on aggregate wheat yields", impacting overall food security in the continent. For the Indian economy, there is some more bad news. In the ranking of vulnerability of beach tourism in 51 countries, India stands out as most vulnerable, and Cyprus the least. “Recreation and tourism is one of the largest sectors of the world economy accounting for 9% of global expenditure,” says Delhi University’s Surendra Kumar, one of the lead authors of the report. 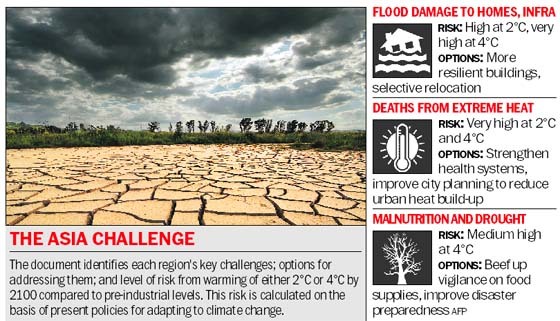 According to Aroma Revi, director of Banaglore-based Indian Institute of Human Settlement, IPCC researchers have this time touched upon crucial social sciences aspects, dwelling upon effects of climate change on rural and urban lives, livelihoods, health risks and economic impact. “Livelihood and poverty, human security and urban and rural areas have been added to cover socio-economic, cultural and regional planning aspects. Besides, there is now clinching evidence that climate change is happening,” Revi says. There are three key points made by the IPCC Working Group II in ‘Climate Change 2014: Impacts, Adaptation, and Vulnerability’. One, effects of climate change can be seen on all continents and across the oceans. Two, the world, in many cases, is ill-prepared for risks from a changing climate. And three, there are opportunities to respond to such risks, though the risks will be difficult to manage with high levels of warming. The IPCC warns of risks such as severe ill-health and disrupted livelihoods for large urban populations due to inland flooding in some regions. Besides, it also cautioned about systemic risks due to extreme weather events leading to breakdown of infrastructure networks and critical services such as electricity, water supply, and health and emergency services. Health risks include risk of mortality and morbidity during periods of extreme heat, particularly for vulnerable urban populations and those working outdoors in urban or rural areas. Then there is this risk of food insecurity and the breakdown of food systems linked to warming, drought, flooding, and precipitation variability and extremes, particularly for poorer populations in urban and rural setting. The report also talks of risk of loss of rural livelihoods and income due to insufficient access to drinking and irrigation water and reduced agricultural productivity, particularly for farmers and pastoralists with minimal capital in semi-arid regions.